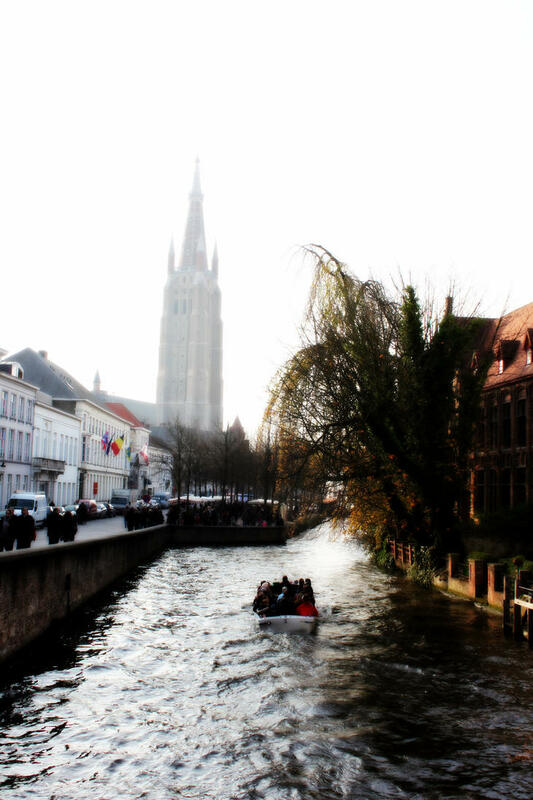 The weekend of November 11-13 was the Brugge Chocolate Festival. Belgium is known for its chocolate, so it was imperative we see the latest trends in chocolate! On the way, we stopped by Wuppertal to ride the rails suspended over town and river. It was a unique experience, and economical to build mostly over a river than plow through the city streets. We stayed at a cute hotel in the historic Brugge center and attended the chocolate festival located in the Bell Tower the next day. Honestly, while we saw some fantastic chocolate artwork, it was just a series of chocolate stalls. 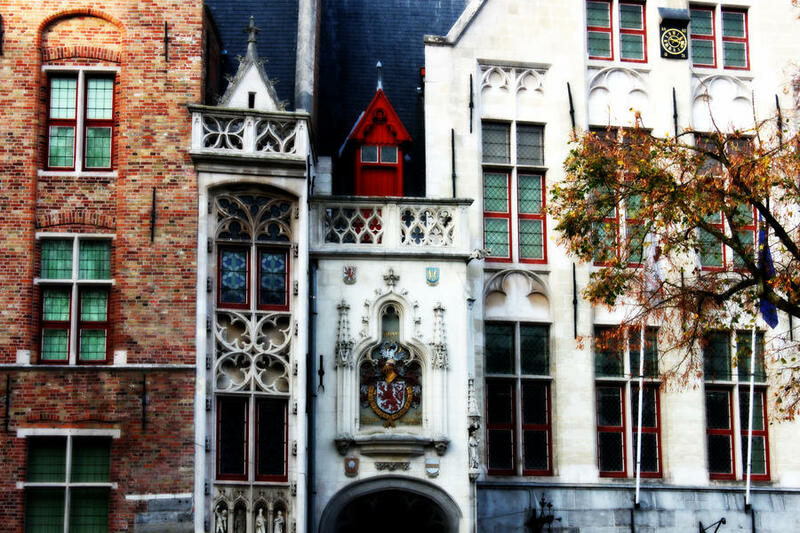 We wandered the streets of historic Brugge afterward and found many fantastic chocolate shops sprinkled throughout the area. It’s a beautiful location with the canal circling it like a mote. Nearby was also a flea market we spent some time wandering through. 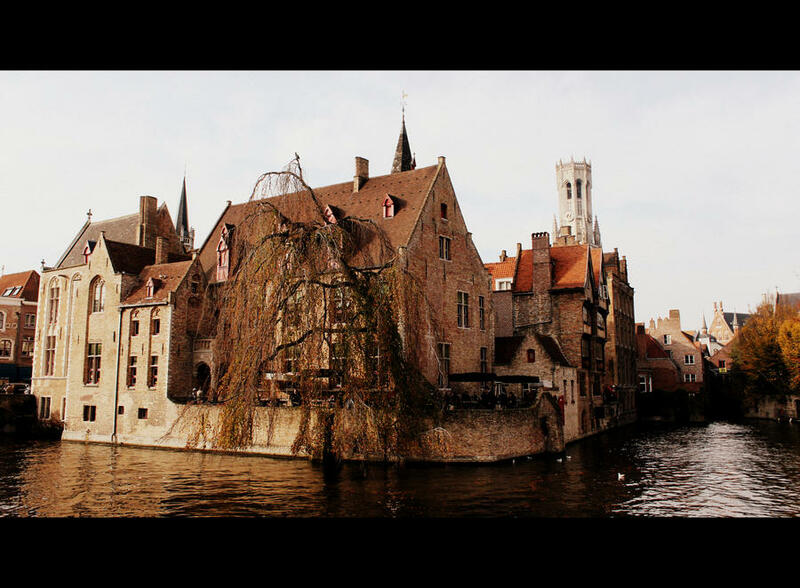 Overall Brugge is a pleasant place to visit and just take it all in. And it’s a great place for chocolate lovers, with or without a festival. 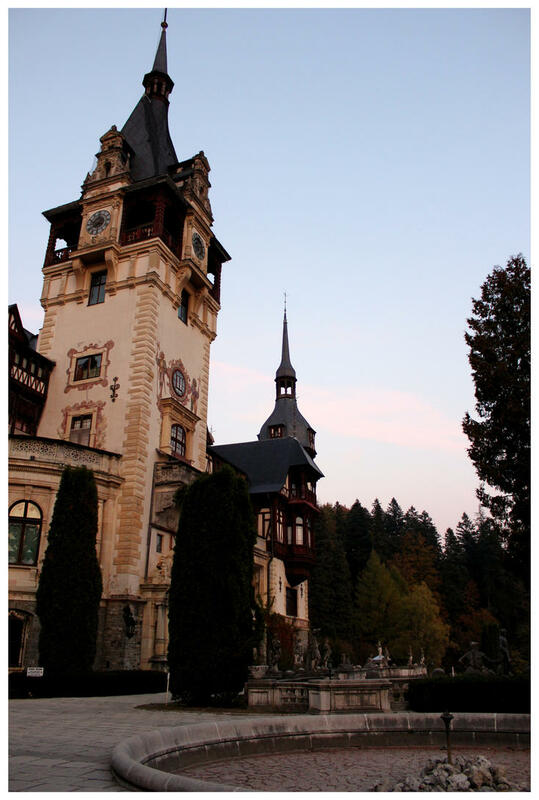 A friend and I took a trip to Romania to celebrate a “vampiric” Halloween. My first guided tour, it took a while to get used to being stuck on a bus. But the tour guide and bus driver were amazing, and in the end I learned a great deal. 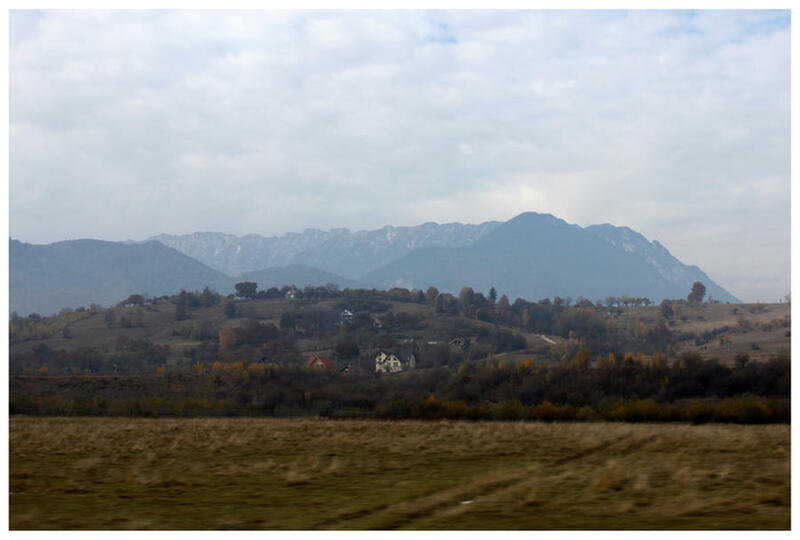 Most of the first day was spent traveling from Bucharest to Brasov. On the way, we found out a few things. Romania is a very rich land (in resources and potential), but it is still recovering from a Communist regime. Buildings are decrepit, in disrepair or unfinished. Trials continue to hold back the original owners from reclaiming them as current tenants fight to keep their communist-era apartments. Also during that era farmers were forced to urbanize and had to leave behind their family pets to live in small city apartments. The stray dog crisis reached a climax in the 90s. Fortunately, from what we saw, the dogs are healthy and well behaved. In another decade or so much of Romania will resemble much of western Europe with pedestrian streets of shopping and a blend of history, culture, and modern design. Romanians are also very friendly and can speak English and several other more common European languages. 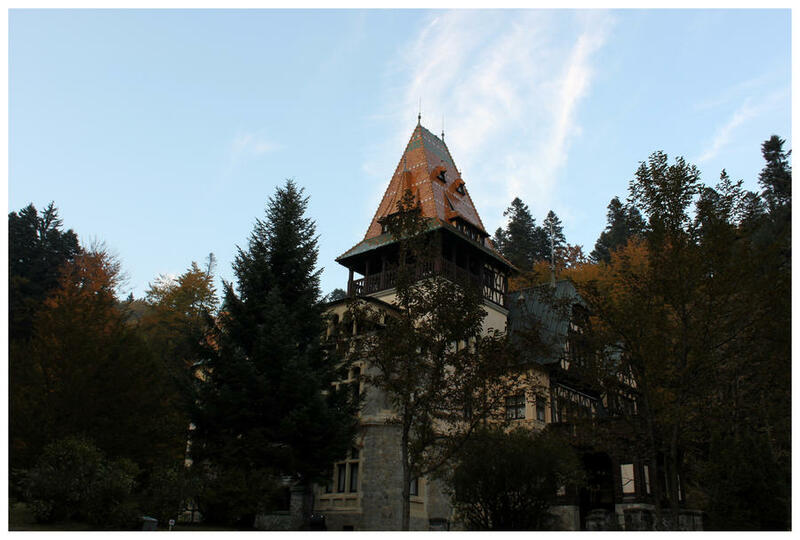 We stopped at Sinaia along the way to see the Peles Palace, the summer residence of the first Romanian king. 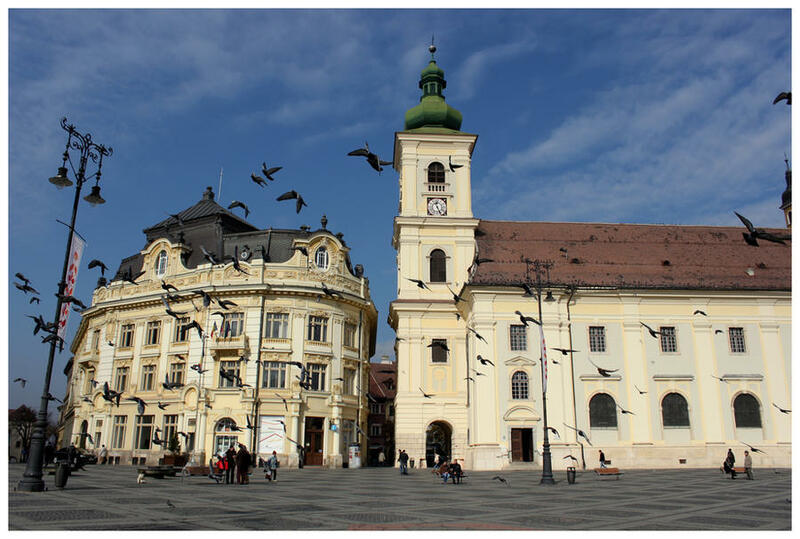 We started Halloween Day by walking around Brasov, seeing the Black Church, town square, and the orthodox church (Adormirea Maicii Domnului) there. We bought silly hats and had molten chocolate cakes, a great way to start off the day. Boarding the bus, it was off to Bran Castle. Along the way we were told the castle has nothing to do with Vlad Dracula, which was disappointing, but rather was a random selection by Bram Stoker for his gothic book Dracula. 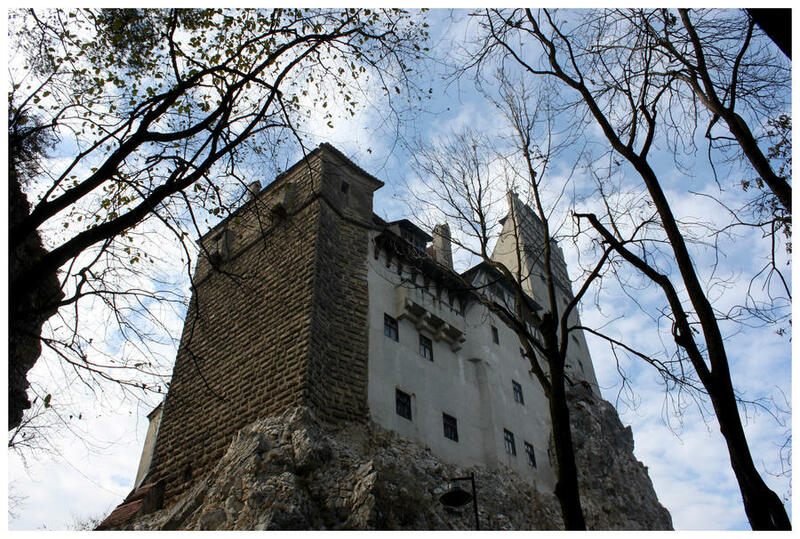 Despite its lack of connection to the real Dracula, I really liked Bran Castle. At the entrance are many little shopping stalls manned by old ladies knitting, and the castle itself is remarkable. It was a summer residence for the royal family and is labyrinthine (at least it felt that way). It is set atop its own short hill and commands some lovely views. The weather was beautiful as well, couldn’t have asked for better! I had a quick lunch of green bean soup and my colleague had a traditional meat and potatoes menu item that looked delicious. 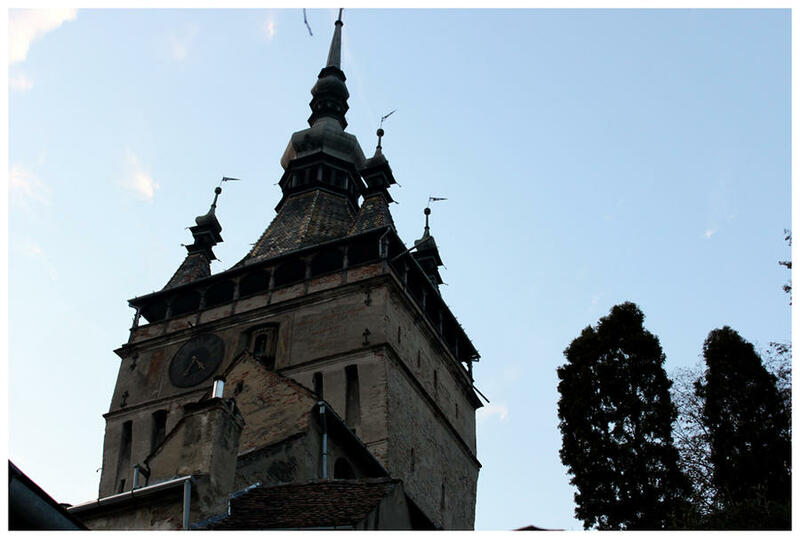 Then back on the bus for the trip to Sighisoara, the birth place of Vlad the Impaler. We arrived with just enough light to walk around the UNESCO site, a medieval walled fortress in which Vlad’s birth house still stands and includes lots of guild towers, a clock tower, and buildings from the original fortification. Our hotel was a quick walk down the cobbled street to the Hotel BinderBubi… a surprisingly 5 star hotel with an awesome name. Everyone donned their Halloween costumes (I was a giraffe), then we walked back up to Vlad’s house for another four course meal. 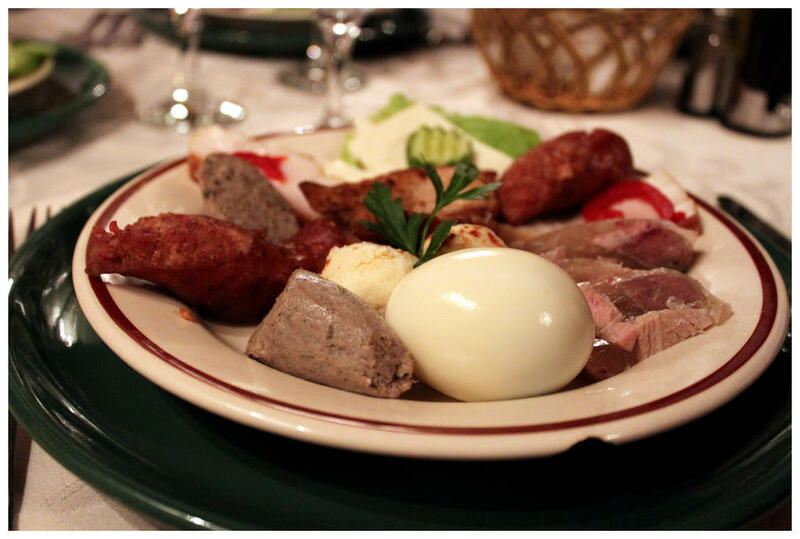 I have learned that sheep cheese is too strong for me, and Romanian cold cut meats too fatty. It was a fun experience though, and we had good company. 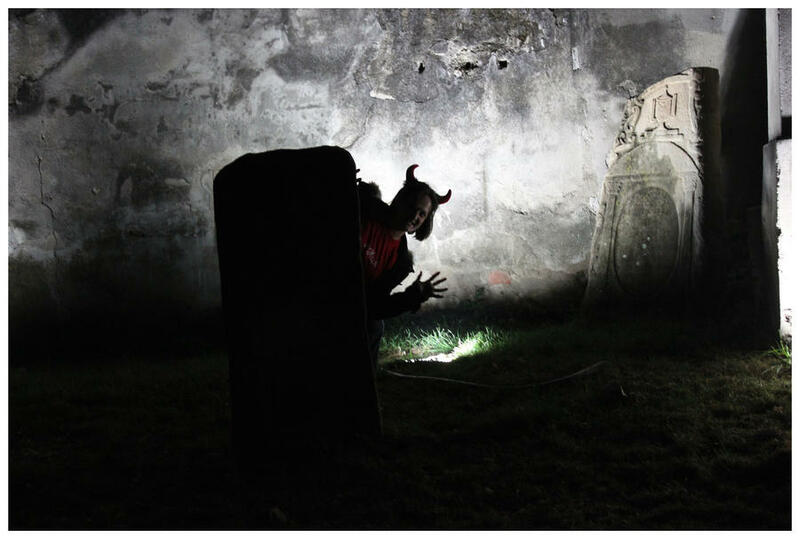 “Dracula” came by for a quick visit, then we departed for a late romp around the medieval church with its tombstones that overlooked the city. 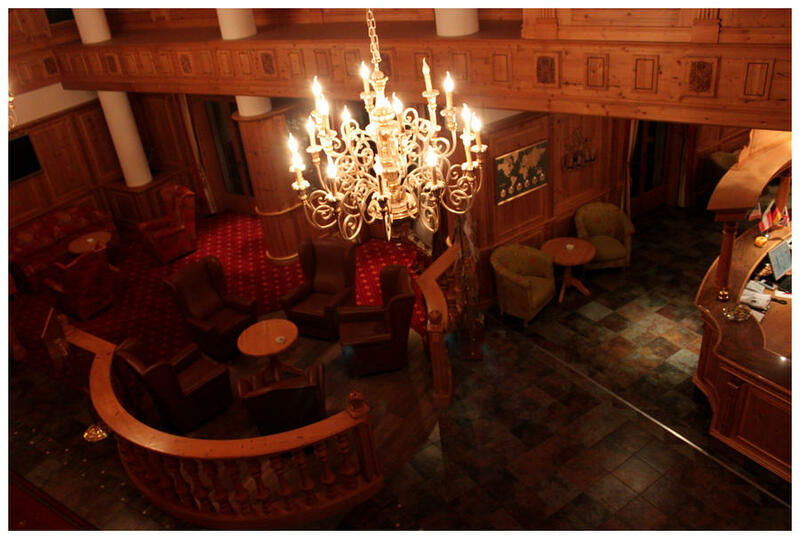 The tour set up a Halloween party in the hotel’s cellar, but my friend and I were too tired to stay long. It was a good day to celebrate Halloween, although I wish we could have seen Vlad Dracula’s actual castle now. 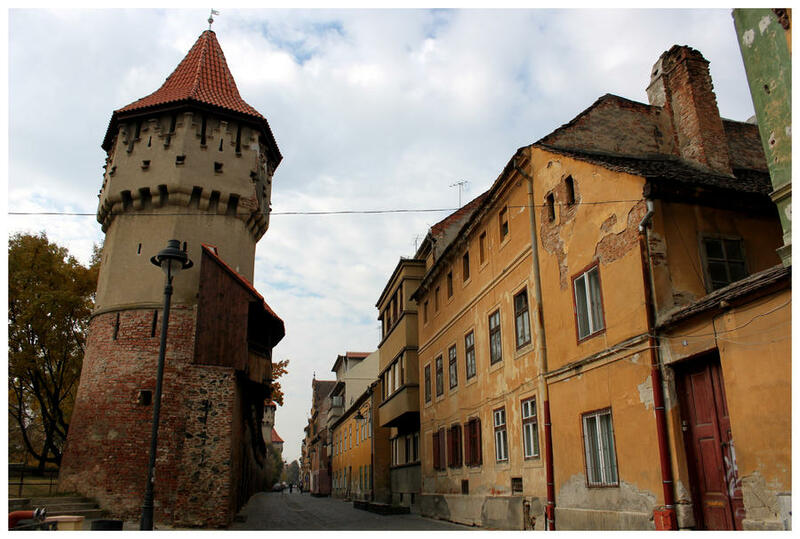 After a big breakfast (all the hotels had great breakfast buffets), we piled back in the bus for our third major city of the “Seven Castles,” or Siebenbürgens; Sibiu. 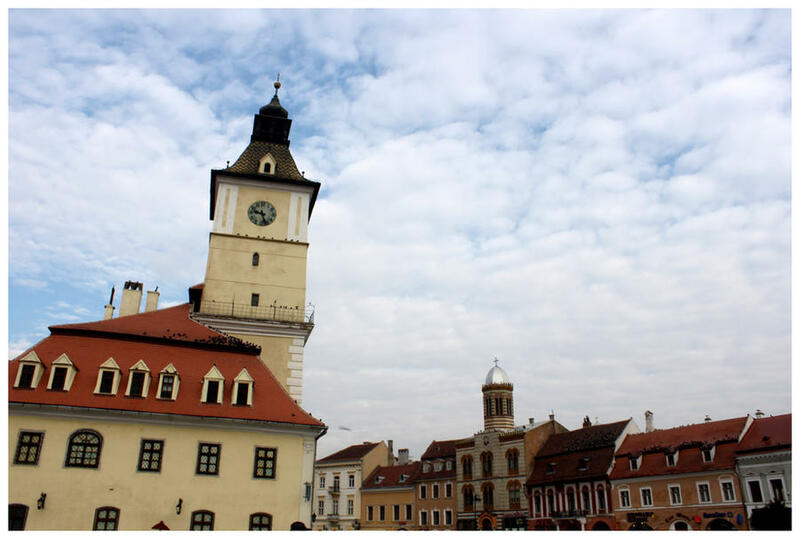 The seven cities is what made up Transylvania, a name given by the Germans. We walked past another guild tower (many and many of these in the medieval areas we visited) and city wall before we walked down one of the main pedestrian shopping streets. At the end of that is the Goldsmith’s Square, one of the largest plazas in Europe. Our tour guide pointed out the gothic “eyes” that watched you – small windows in the building roofs that really do look like eyes – and the circular structures dotting the ground that were discovered to once be cereal granaries to feed the animals once sold in the plaza. We had an hour and a half to wander around the shopping area, big square, and the adjoining Small Square. I had ice cream, which was pretty tasty. I still liked the ice cream in Rome the most though. The drive back to Bucharest is a long one from Sibiu, so we pulled over at a monastery along the Olt River for a break and some beautiful scenery with the autumn tree-lined hills on the other riverbank. Bucharest, however, was scary! The cars and traffic were incredible, and I really appreciate how awesome our bus driver was at navigating. We saw a bit of the town at night as we made our way to the hotel in the center, but it took us longer than we had hoped so only had 15 minutes to get into our rooms and back to the bus to go to dinner. We were taken to a restaurant called The Seagull, which served another four course meal (with the infamous pickled vegetables) and included live folklore performances with dancers and musicians. The music was fast paced and entertaining featuring violins, bass, dulcimer, and pan flutist. Thoroughly stuffed, we made it back to the hotel and passed out. The last hotel behind us, our tour guide gave us a whirlwind tour of the city, also known as “little Paris” for its attempts to replicate the French city. It features an Arc de Triomphe and a “Champs Elysees” style road with 41 fountains. 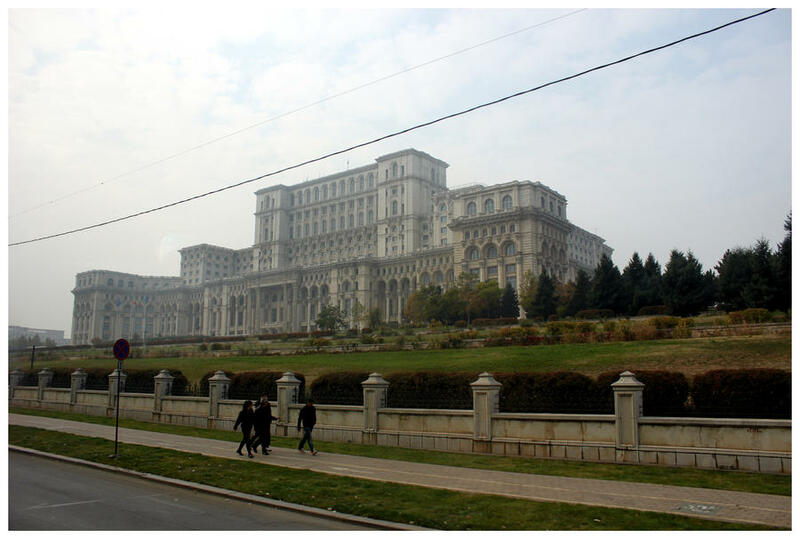 Bucharest also has the second largest building in the world, the Palace of Parliament (third largest in volume). Originally designed by the communist leader Ceausescu, the new Romanian government determined it would be more expensive to destroy it than to finish it. We went on a 40 minute tour of it, and at the end found out we had seen 4% of the still unfinished building. It is completely made with Romanian materials and resources and sports a utility bill of 5 million euros (or was it Lei?) a year. Yikes! 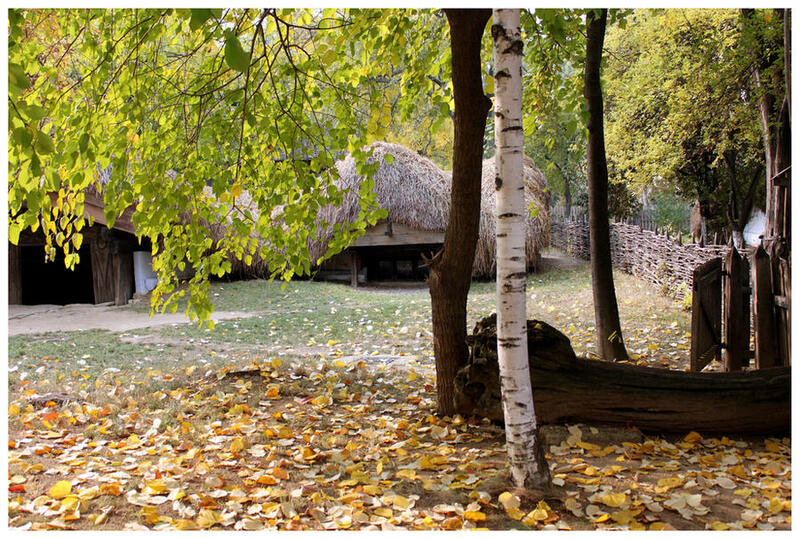 The last destination was the Village Museum, an outdoor area with over 80 buildings that represented many ages of Romanian’s history. 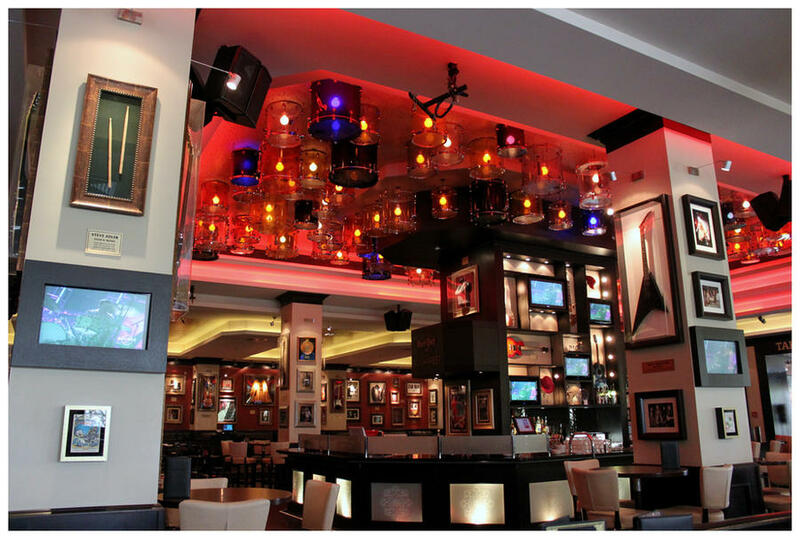 Afterwards, my colleague and I took a ten minute walk down the street for a late lunch at the Hard Rock Cafe. With a little time left before the drive back to the airport, we stopped at a covered shopping area with stalls stacked on top of each other. In the end we didn’t buy anything, but when they saw us, they added an additional zero to anything we were interested in (even though the price was clearly labeled). Ah, opportunists. Romania turned out to be an enlightening and fun trip. We ate too much and didn’t get to see the “real” Draculesti castle (believed to be Poenari Castle, which was nearly on the way! ), but we learned a lot and saw enough to make it worth it!